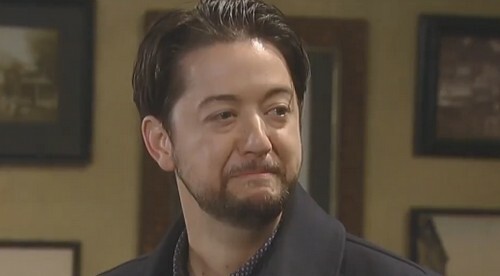 General Hospital (GH) spoilers for Thursday, November 30, tease that Spinelli (Bradford Anderson) will return to Port Charles. Once he meets up with Patient Six (Steve Burton), he’ll get on the classic SB Jason bandwagon. Spinelli will agree that P6 is the real Jason Morgan, so he’ll see what he can do to help him prove it. Meanwhile, Sam (Kelly Monaco) will seek updates from current Jason (Billy Miller). She’ll wonder if he figured out how he knows Kim (Tamara Braun). Jason will probably suggest that he has no idea, but it’s clear that he feels a connection. Elsewhere, Oscar (Garren Stitt) will want to get a few things off his chest. He’ll have an intense confrontation with his mom in Thursday’s new GH episode, November 30. General Hospital spoilers say Oscar will push Kim for the truth. He’ll contend that he can’t stand not knowing who his father is. Josslyn (Eden McCoy) may fill Carly (Laura Wright) in on their search as well. After Carly scolds Joss for sneaking out again, she’ll demand an explanation. Josslyn might admit that they’ve been on a mission to find Oscar’s dad. Since Miller’s character is most likely Drew, they believe he may be the man they’re looking for. Josslyn won’t be off the hook, but at least her hints could help Carly crack the case. Carly might assume that Kim hasn’t been completely honest. Kim’s relationship with Drew was obviously much deeper than she’s letting on. Other General Hospital spoilers say Jordan (Vinessa Antoine) will get tough with Andre (Anthony Montgomery). She doesn’t buy that he’s some malicious monster who just wanted to hurt the twins. Jordan thinks there’s more to the story, but she needs Andre to divulge it. She’ll push Andre to prove she wasn’t wrong about him. Back in PC, Patient Six and Sonny (Maurice Benard) will grill Dr. Obrecht (Kathleen Gati). They’ll seek answers about Faison (Anders Hove), but Dr. O may not be willing to offer much information. She’ll talk about how Jason Morgan was a valuable asset, but she probably won’t cough up any hard evidence. They’ll have to work harder if they want to find Faison and tie him to this twisted plan. Across town, Franco (Roger Howarth) and Liz (Rebecca Herbst) will face some conflict. It looks like Liz will back up one of the Jasons. Franco won’t understand what’s going on. He’ll get suspicious and demand to know why Liz is taking someone else’s side. The good news is this fight won’t last long. The bad news is Franco’s still keeping major secrets. Once Andre comes clean later this week, Franco will have to decide how much he should reveal. He’ll have the chance to get away with his secret-keeping, but his conscience may not let him. It sounds like Franco will continue to find himself in stressful situations. We’ll keep you posted as other GH details emerge. Stay tuned to the ABC soap and don’t forget to check CDL often for the latest General Hospital spoilers, updates and news.